Tried also at 75x with [OIII] filter without any success. Also nothing visible at 100x with UHC filter. Small, faint, evenly bright, round disc. Small, round, evenly bright nebula. 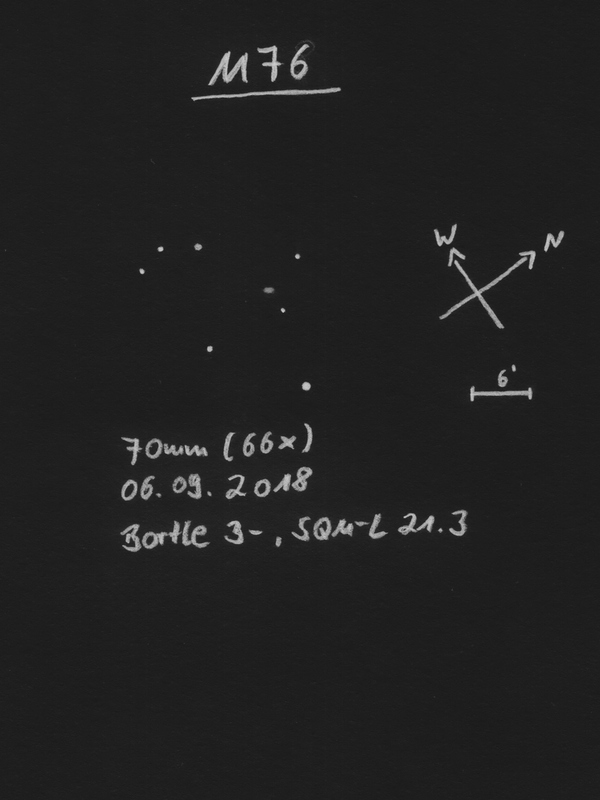 When knowing the exact position fairly easily visible with averted vision as quite small, nearly stellar brightening. At 25x without filter extremely faint, roundish brightening. With UHC filter significantly higher contrast, but still faint. At 41x faint, evenly bright, roundish. Relatively well seen with averted vision. Small, evenly bright with a rather rectangular shape. With UHC filter almost visible with direct vision. At 10x rather inconspicuous and very small. Well visible with averted vision. At 66x the nebula appears slightly elongated with a square shape. Barely seen with direct vision. 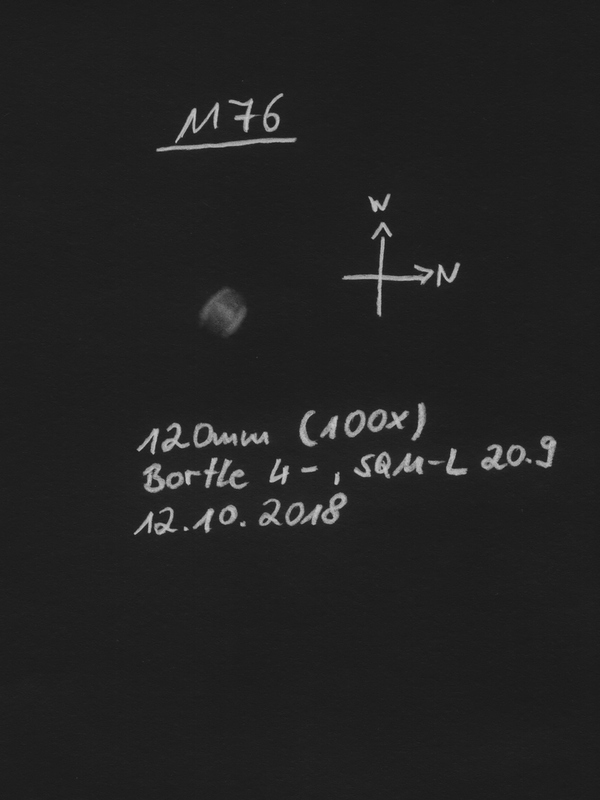 Almost full moon with an angular distance to M76 of about 60°: Only visible with averted vision, relatively small, roundish, diffuse, structureless. Overall quite faint. At 28x a small, diffuse brightening, which can be seen quite well with averted vision. At 100x slightly elongated, whereby the shape appears irregular. At 40x with OIII filter conspicuous, slightly elongated with rudimentary visible arcs on the NE and SW side. Without filter rather faint. At 100x the arcs are quite well recognizable, especially with UHC filter. 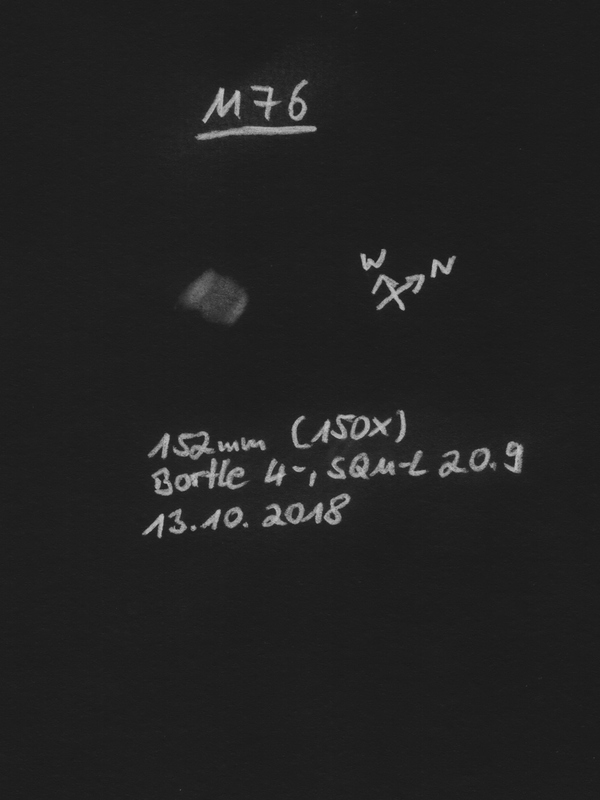 At 40x just a small, faint, round brightening. At 66x the arcs at the NE and SW end are visible. I did a sketch at 100x.